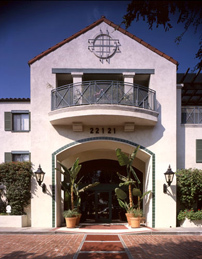 Avalon Courtyard is a 92-unit, tax credit building located in Carson, CA for people 62 and over. The waiting list is currently closed. Avalon Courtyard features a spacious recreation room, exercise equipment, library, computer room, laundry room, ping-pong table and on-site management. Monthly activities include bingo, coffee socials, movie nights, birthday parties, Tai Chi, yoga, and other group activities. The one bedroom units include a stove, refrigerator, garbage disposal, central heating and air-conditioning, carpeting, window treatments, balconies and fire sprinklers. Parking is available in a subterranean parking garage. Avalon Courtyard is conveniently located near public transportation, a community senior center, City Hall, restaurants and markets.